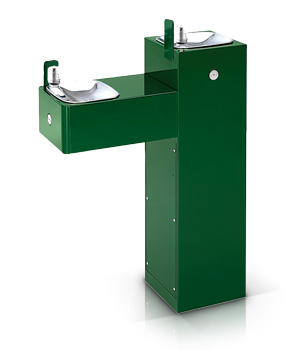 Model 3300 is a contemporary pedestal drinking fountain that is ideal for pedestrian and wheelchair access. Model 3300 features front push button, polished chrome-plated brass bubbler head and waste strainer, satin finish stainless steel bowl, heavy 11 gauge steel pedestal with galvanized finish, access plates with vandal-resistant screws and 1/2" NPT screwdriver stop. Mounting includes an integral mounting base with four bolt holes. Anchor bolts are included.